How to Get Rid of Red Eyes? : Do you find your eyes constantly red and tired? This is probably because you have gotten a red eye, a common condition that is harmless and typically short-lasting. 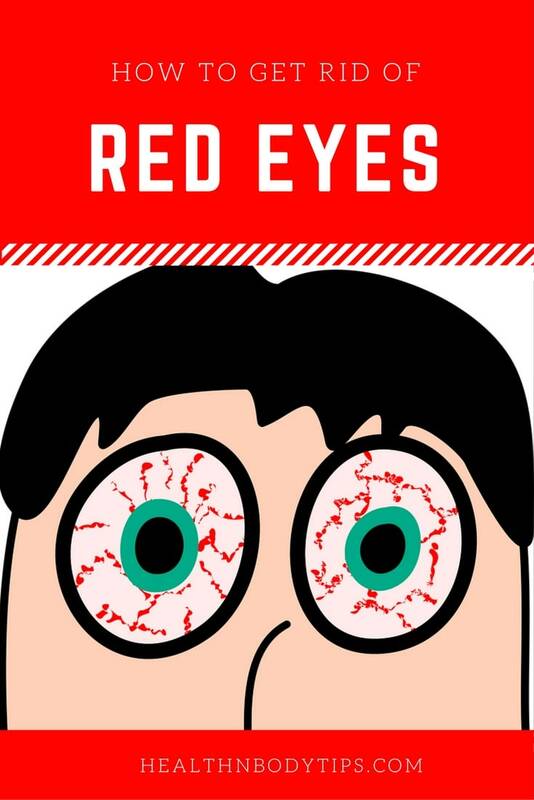 Red eyes can be one of the results of fatigue and staying up for long hours. Most people assume that red eyes is caused due to an allergic reaction to dust. While this can be true in some cases, other causes can be warm climate, wearing contact lenses, computer vision, eye injury, glaucoma, lack of sleep and even cold and flu. In some cases, hormonal changes during pregnancy, smoking or even swimming in chlorinated water can cause red eyes. Although red eye is quite common today, it is no reason for fear or concern. In fact, there are quite a few natural remedies that can be used to treat red eyes just at home. Read on to know what you can do should you contract red eyes! How to Get Rid of Red Eyes / Bloodshot Eyes? Made from Rosa Damascene, rose water contains anti-infective and anti-inflammatory properties, making it a great herbal remedy for various eye conditions such as conjunctivitis. Soak 2 cotton balls in rose water and place them over your eye lids. Leave them on for 15 minutes. Repeat twice a day. You can also dip 2 slices of cucumber in rose water and place them over your lids. Cucumber’s water content and rose water’s cooling effect, when combined, works well in getting rid of red eyes. Alternatively, you could also squeeze 2 to 3 drops of rose water into your eyes, or you could also wash your eyes with it. The herbal water works as an antiseptic solution, helping cure eye infections and reducing puffy eyes. Due to its cooling effect and anti-inflammatory properties, cucumber is one of the most effective home remedies for red eyes, especially in reducing the swelling associated with the condition. Place a cucumber in your fridge for 10 to 15 minutes and then cut it into slices. Place a slice over each closed eyelid for some time, about 10 minutes. You will notice the welling disappear, as well as reduction in the intensity of your red eye. If you’re here to know how to get rid of red eyes, this is one of the most convenient remedy yet. Do you have used tea bags you were planning to throw away? Do not do that just yet. Instead, refrigerate them and try placing the tea bags over your eyes. Tea contains tannins that in turn antimicrobial properties that work effectively in reducing under-eye swelling and red eyes. Chamomile tea bags are a great choice in this case. Bonus: Tea bags, when placed on your eye lids regularly, will also reduce eye bags and fend off dark circles. Milk protein contains amino acids that have anti-inflammatory properties, making it a great home remedy for red eyes and other eye infections. Soak a cotton pad in cold, raw milk and then gently rub it over your closed eye lids for 15 minutes twice a day. This compress is great for preventing redness of the eyes. You can also make your very own homemade eye drop with equal amounts of milk and honey and squeeze 2 to 3 drops of the mixture into each eye. Must read: How to Grow Eyebrows Naturally? The ultimate step to attaining healthy pair of eyes is to eat more foods that are rich in vitamins and minerals. One of such food are potatoes, which are a great source of Vitamin E, making it effective in preventing eye infection and diseases. You may also alternatively use it as a topical remedy. Cut into thin slices or grate a potato and store it in your refrigerator. Once it is properly chilled, place the slices or grated spud over your eyes for 15 to 20 minutes. For best results, use this remedy before you go to sleep. Also read: How To Improve Eyesight Naturally? Carrots contain beta-carotene and Vitamin A, while spinach is a good source of minerals such as Zeaxanthin and Lutein. These essential vitamins and minerals are important to keep your eyes healthy and control infection overall. Simply run these vegetables in a juicer drink it regularly to treat red eyes as well as to control its itchiness. Fennel seeds are an excellent eye tonic, and can improve your eye health tremendously when consumed raw regularly. To get rid of red eyes and any other eye inflammations, simply make a compress out of toasted fennel seeds. Warp and tie them up with a piece of cloth while the seeds are still hot, and place it on your eyes alternately. Another method is to rinse your eyes with fennel water. All you have to do is boil ½ tablespoon of fennel seeds in 1 cup of water for 25 to 30 minutes. Strain the liquid, and allow it to cool down before using it to rinse your eyes. Also read: How to Get Rid of Stye? You would have probably heard of the versatility of ACV in treating multiple infections and inflammations over and over again. But did you know that it is also one of the best treatments for red eyes? It contains malic acid, which is known for effectively curing bacterial infections. Mix 1 tablespoon of ACV in 1 cup of water. Take a cotton ball, dip it in the solution and clean your eyes with it. Let the solution enter your eyes, and gently massage your eye lids. This will also relieve you from the itchiness associated with red eye. Green tea goes beyond just strengthening immune and slimming down your body. It is proven to cure a red eye too. Place two green tea bags in a cup of boiling hot water, and allow it to steep. Once the tea cools down, remove the tea bags and use the liquid to wash your eyes twice a day until the symptoms have completely disappeared. Alternatively, you can place the tea bags directly onto your eye lids for 10 minutes. The antioxidants from the tea will reduce inflammation, remove dust and cure any infection effectively. This frequently used kitchen ingredient contains a steroidal saponin that helps reduce inflammation naturally. Soak a handful of the seeds in water for about 9 hours or overnight. Grind them into a thick paste and apply it on your closed eye lids. Let this stay for twenty minutes before you wash it off. Repeat this every alternate day for best results. You never have to wonder how to get rid of red eyes anymore, now that we have given you one of the most convenient list of remedies to treat them at home. Not only are the natural and safe to apply, the ingredients used in the remedies are easily available in any household. Try them out, and get back to us with your feedback.